I have a lot of sayings that i live by. They are trite, but true. One of them is: IT’S BETTER TO BE LUCKY THAN GOOD. Another is: IT’S NOT WHAT YOU KNOW; IT’S WHO YOU KNOW. Well, I don’t think I’m particularly good, so I must be lucky, lucky enough to know a couple of people in New Zealand, who, once they got the idea that I could be brought down under to see them, followed through on that idea and made it happen. I created a fan club for Tunnels and Trolls players on the internet. You can find it at http://trollhalla.com. It has been going since about 2002 or maybe earlier. The internet gives it international scope, and T & T has had international scope since the 1970s. In fact, T & T beat That Other Game to both Britain and Japan and perhaps some other countries as well. It is not surprising that there are players and fans in places like New Zealand. When offered a once in a lifetime chance to go to New Zealand I leaped at it. My trip lasted from April 5 to April 20th. I left Phoenix on the 5th and arrived on the 7th fairly early in the morning. I left the islands on the afternoon of the 20th and arrived in Los Angeles at 6 a.m. on the 20th. Heh! Time travel! 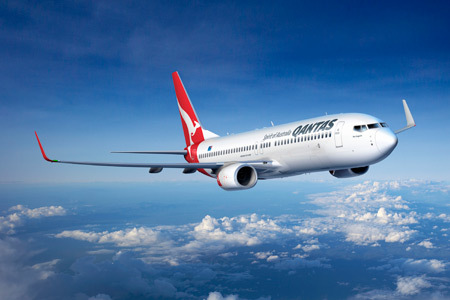 My time machine was a Qantas airplane–both directions. This isn’t going to be a very organized travel blog. This is Atroll’s Entertainment, and I mean to tell you that I had a wonderful time on this trip. My plan is to simply show you about 10 pictures each time on this trip and talk a little bit about what I saw and did. Mostly, it’s to get the pictures on the internet so that family and friends who have never been there can get an idea of the experience. I hope my memories and observations amuse you, dear reader, but if they don’t, feel free to bug out of this blog at any time. 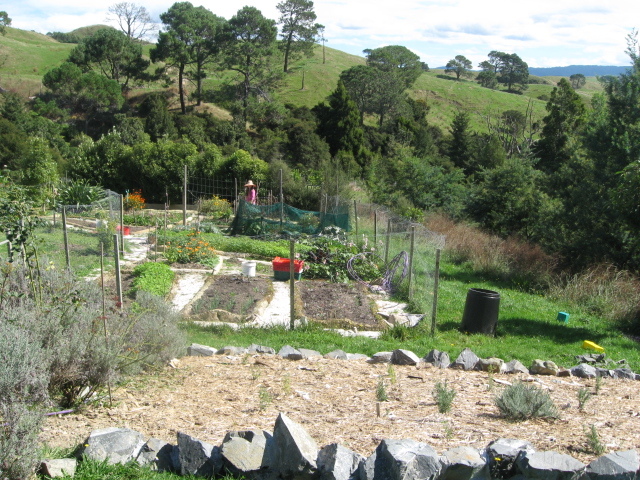 A garden in the bush. My principal guide and sponsor on the North Island was a man named Mark Thornton. Mark is an expatriate Englishman who got tired of being a stockbroker in England, and decided to go south to seek his fortune. At present he wears multiple professional hats, and one of them is as a farmer. He has a small farm in Miranda. 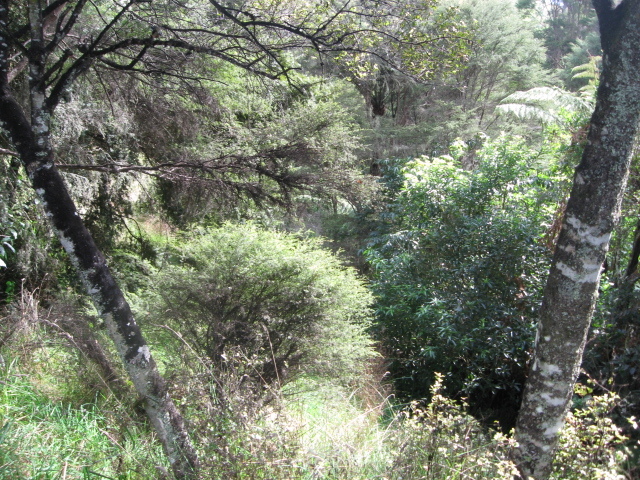 The first picture I took was this one, showing the garden just downhill from his house, and the wild bush beyond it. I thought it was just a beautiful scene. A lot of the pictures I took came from Mark’s farm. My word for this kind of place is jungle. I guess they call it "bush" down under. New Zealand is extremely mountainous. There are some flat areas, but I didn’t see any of them until the second week I was there. It rains a lot, and the vegetation grows wild. I was very impressed with how wild the countryside seemed, all this less than 50 yards from the main house. I wanted to fight my way through this stuff, but I didn’t have a machete. Thick forest like this is just alien to an Arizona boy like me. I took a lot of pictures like this because I just love the look of it. Did not get deep into it, however. No place to walk. 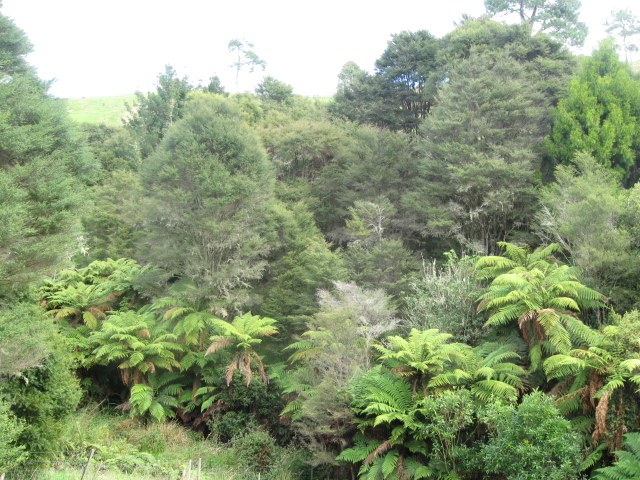 One thing I saw a lot of in New Zealand that I haven’t seen much in other parts of the world are ferns. The vegetation just seems more primeval–left over from an earlier, lusher stage of Earth’s history. Home is where you go to bed. Here are my sleeping accommodations most of the time I was in Miranda. 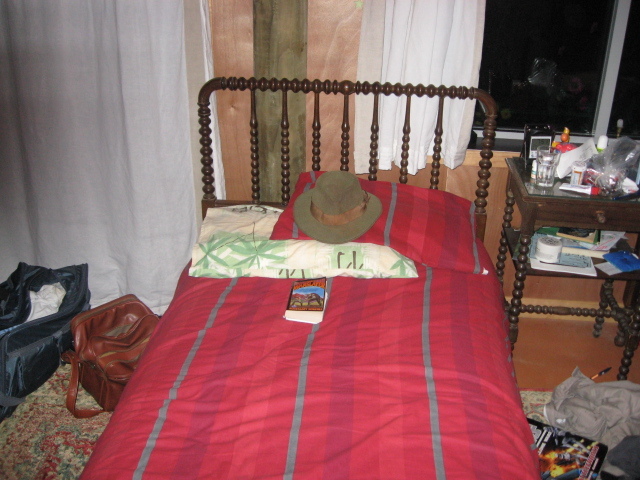 The Trollgod's hat has center stage on this bed, and looks very comfortable. On my second day in Miranda I went for a walk up the road from Mark’s farm. These scenes won’t look so strange to people who live in the country, but they’re rare and exotic for a city boy like me. I wasn't sure at first what kind of birds these are, but they turned out to be turkeys. 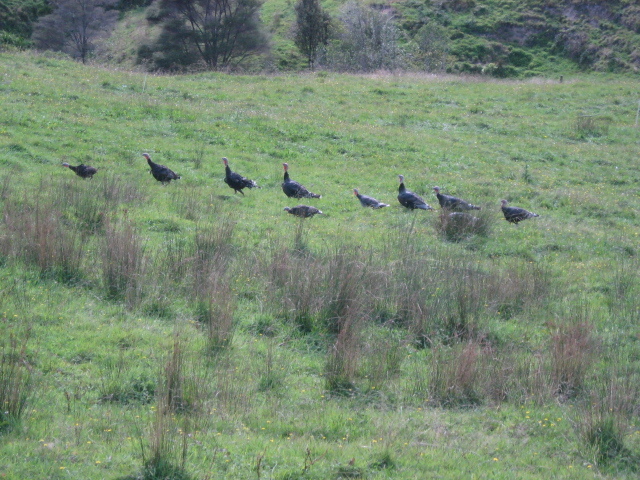 I never knew that turkeys would line up like geese. My host had chickens. These cows are enormous in real life. 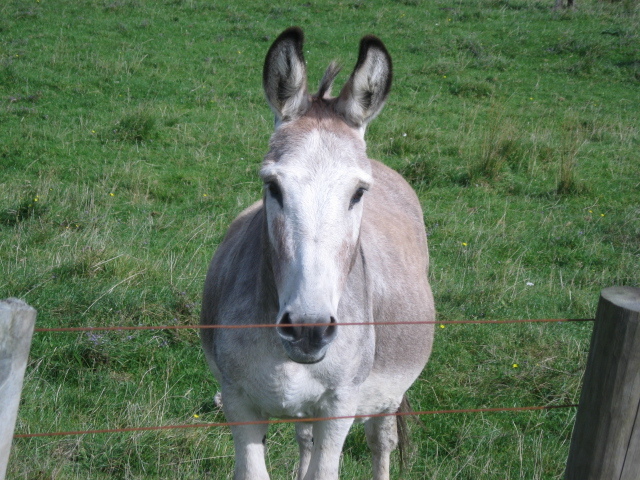 I met a friendly donkey on my walk. I haven't seen a donkey since I was a kid 50 years ago.. Nothing really showed me I wasn't in the U.S. any more like the road signs. 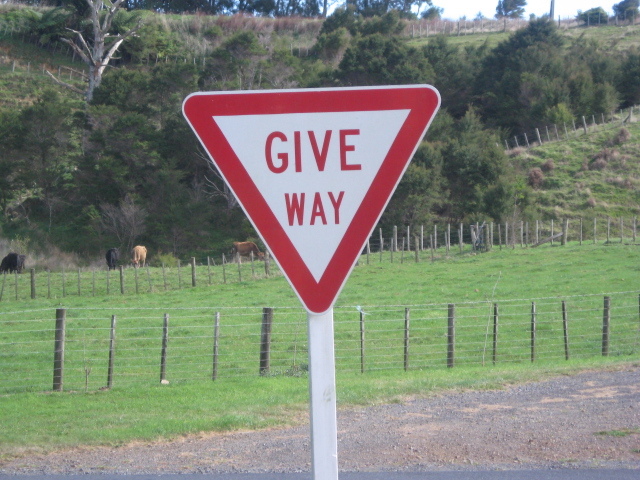 There are a lot of Give Way signs in New Zealand and very few traffic lights. I'd guess we have more stoplights in the city of Phoenix than thay have in the whole country. 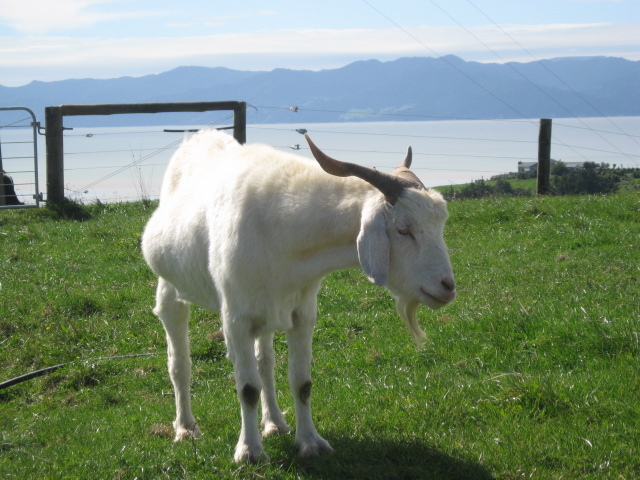 You can see the waters of the Coromandel Bay and the mountains on the Coromandel Peninsula beyond this handsome goat. I will go off and explore that country on the morrow. 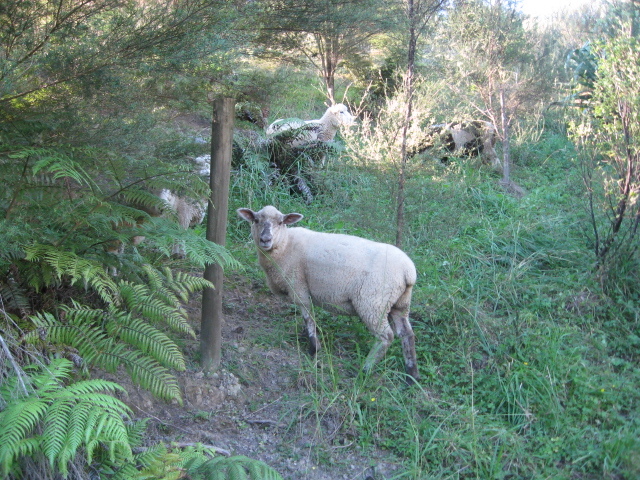 The zoo tour continues as I meet one of Mark's sheep that afternoon in a remote corner of the farm. I think I’ll end this part of the blog here today. Tomorrow I will leave my friend’s estate and go on a road trip around the North Island. 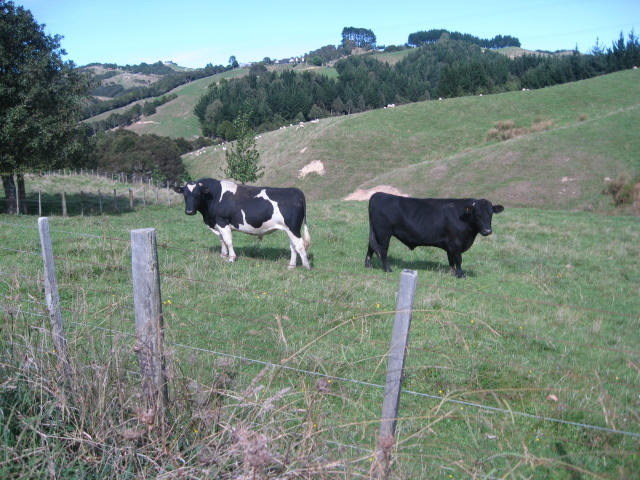 If you’ve ever been to New Zealand, or spent time on a farm, feel free to leave some comments here.